Alexander Kuleshov is a specialist in the field of information technologies and mathematical modeling. 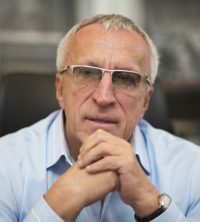 In 2006, he was elected Director of the A.A. Kharkevich Institute for Information Transmission Problems (IITP) of the Russian Academy of Sciences. At IITP, he also served as the chairman of the Academic Council, Chairman of the Doctorate Dissertation Council, and Chair of Information Transmission and Processing. Throughout his academic career, he authored and co-authored 54 studies, including 4 monographs.